There are numerous reasons a child may become constipated. If you suspect that it is due to dietary imbalance, try to increase your child's intake of fiber and fluids. Children may also be constipated for other reasons. If you help your child make changes to the foods she eats and she does not resume normal bowel movements, then consider other causes of constipation. Regardless of gastrointestinal issues, your child will benefit from a balanced diet. Not all fruits contain high amounts of fiber. In fact, apples and bananas may have the opposite effect on some children and adults. Avoid these two fruits if your child is constipated. Opt for choices like apricots, plums, peaches and pears. Dates, raisins and prunes are also beneficial to a constipated child. Dried fruit may have more additives and sugar than fresh fruit so opt for fresh whenever possible. Nearly all green vegetables are high in fiber and may relieve constipation. Feed your child peas, spinach, broccoli and beans to increase their fiber intake. Starches, like white potatoes, do not fulfill the role of a high-fiber vegetable. Encourage your child to try better alternatives like sweet potatoes and squash. A salad full of dark green lettuce can improve your child's bowel movements while providing them with many vitamins. If your child does not have an allergy to nuts or legumes, try almonds and chickpeas. White grains do not have the same fiber content as whole grains. Provide your child with needed fiber by feeding him food made with oats, barley, rye and brown rice. Many products on the market, including children's cereals, are now made with whole grains. Adding these healthier versions to your child's diet may not only relieve constipation, but also help him meet daily nutritional requirements. Consuming the right amount of fiber may still cause a binding effect if too little liquid is consumed to help digest the fiber. Increase your child's water intake by encouraging her to drink several glasses throughout the day. A child suffering from constipation may benefit from extra juice at this time. Try juices made from the high-fiber fruit category, such as prune or pear juice. Constipation: How Do I Know If My Child Is Constipated? 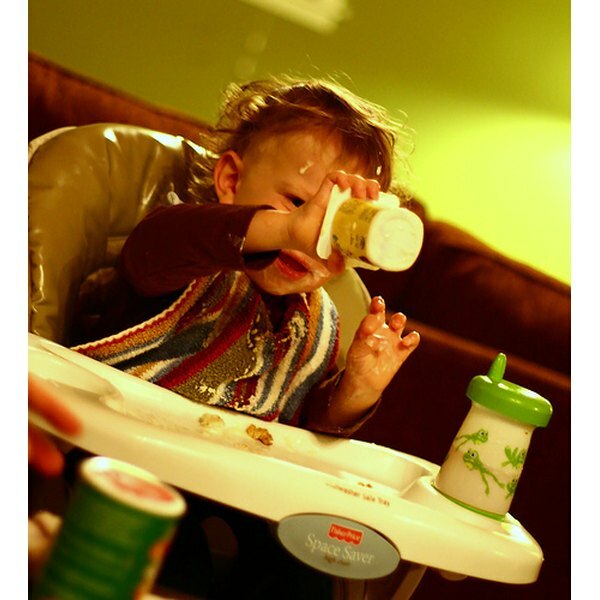 Can a Toddler Have Too Much Fiber? Is Flaxseed Good for Children?